Holy Moley but "Superman/Shazam! : The Return of Black Adam" was good. The short film released last week on DVD and Blu-Ray effectively characterized Superman, Captain Marvel, Billy Batson, Black Adam, and even the wizard Shazam and Tawky Tawny. The voice work is top notch and features the return of actor George Newbern to the voices of Clark Kent and Superman. Newbern voiced the Man of Steel and his alter ego on "Justice League", "Justice League Unlimited", "Static Shock", and "The Batman". Also in a role reprisal, actor Jerry O'Connell voices Captain Marvel just as he did on the "JLU" episode "Clash". The story revolves around Captain Marvel's origin which has been told countless times since Whiz Comics #2. It also involves Cap's first encounter with the evil predecessor to the power of Shazam, Black Adam, another often told Shazam tale. Both stories are melded together and Superman is brought in to hold the piece together with a more popular hero. Superman fans ought to be thrilled as I was to see the Man of Steel being used as the top draw DCU character to generate mainstream interest in what is essentially Captain Marvel's story. Superman serves several important purposes that make him much more than lagniappe in the piece. He very importantly and naturally is the best candidate to ensure that the more casual viewer not assume this is a Marvel Comics movie given the hero's name is Captain Marvel. Superman also has a long history in both the fictional and non-fictional worlds of being compared and contrasted with Captain Marvel. Back when Captain Marvel was a creation and property of Fawcett Comics, Superman's biggest competitor in the comic book world was the good Captain. The Captain Marvel and Marvel Family books sold like hotcakes back in the 1940s. Republic Pictures had a very successful Captain Marvel movie serial years before the first Superman serial. Eventually DC's predecessor sued Fawcett claiming Captain Marvel violated DC's copyright in the Man of Steel. Both heroes had dark hair, both were dark haired reporters in their secret identities. Both had bald scientist bad guys. Both had similar powers of flight and strength. Both wore capes. The case went on for years and, while ultimately victory went to Fawcett, the years of litigation costs and the downturn in readership that affected all the comics companies after World War II resulted in Fawcett going out of business and the Captain Marvel Family going into an early retirement. But the story didn't end there. After serving as the catalyst that shut down Captain Marvel in the 1950s, DC Comics in the early 1970s revived Captain Marvel after they acquired the Fawcett Comics library. When upstart (at that time) Marvel Comics got wind that DC was introducing a superhero with their company name, Marvel hurried to press a comic book with a superhero of their own named Captain Marvel. This ensured that Marvel, the first to press, held the trademark on the name "Captain Marvel". Forever more after that, DC publications with their Captain Marvel have had the cover name of "Shazam!" or some derivation thereof. Since DC's Shazam #1 featured Superman pulling back a curtain that re-introduced Captain Marvel to comic book readers, it was obvious that not only did DC not want readers to forget about the former rivalry between the two heroes but they actually planned to use it to mine new sales. The Captain's initial series at DC never sold like 1940s hotcakes but it was sustained by both a short-lived but popular live-action TV show and the desire by fans to see Captain Marvel team up with or fight Superman, something DC held off on for a while. Captain Marvel was assigned his own Earth in the DC Multiverse, Earth-S, and his adventures took place away from Superman and the mainstream DCU of Earth-1. Superman's arch-nemesis Lex Luthor met Cap's bad guy Mister Mind and briefly met the Captain in the lead story in 1974's Shazam # 15. A red-K raged Superman briefly fought Captain Marvel in the JLA-JSA crossover in Justice League of America #137 (and Superman met Captain Thunder, a Captain Marvel knock-off in Superman # 276 two years after DC started publishing Captain Marvel) but the two didn't actually spend a whole adventure together until the 1978 tabloid Superman versus Shazam! which also featured Supergirl and Mary Marvel. In this new animated feature, we meet Billy Batson as an orphan living on the streets of Fawcett City. Reporter Clark Kent of the Daily Planet is doing a story on Billy hoping to use Billy to give a voice to homeless orphan children. Black Adam lands on Earth and senses that Billy will inherit the power of Shazam that Black Adam also has. Superman fights Black Adam while Billy runs and ends up on the magic subway to the secret hall where the Seven Deadly Enemies of Man reside along with the ancient wizard. Billy meets Shazam and inherits the powers of the Gods whose initials spell out the name Shazam becoming the new Captain Marvel. Superman and Captain Marvel team up to defeat Black Adam. Newbern falls seamlessly back into the role he played on "JL" and "JLU". His Superman is a bit more down-to-Earth than Tim Daly's Man of Steel. When Superman tells Black Adam that he fights for those who can't fight for themselves, you believe in his sincerity. The line tells you everything you need to know about Superman for the purposes of this adventure. Superman also gets some great lines where he gets to distinguish his powers from those of the messengers of Shazam - having heat vision and super breath for instance as well as a vulnerability to magic. O'Connell once again portrays Captain Marvel, a role he played in the "JLU" episode "Clash" (which is among the "JLU" episodes included on the DVD collection). O'Connell is a big kid and is a perfect voice for the kid-turned-Big-Red-Cheese. Zach Callison, 13, voices Billy Batson perfectly. Jim Garner ("The Rockford Files") plays an understated but still regal wizard Shazam. Arnold Vosloo is Black Adam, a role that ought to be played in live-action by The Rock. Vosloo has fun in the only bad guy role in the feature, chewing up the scenery as Black Adam chews up Fawcett City. Kevin Michael Richardson, the Joker on "The Batman", has a surprising role as Tawky Tawny, a part he's much better suited for than the Joker. What's most impressive about this short is it feels like a complete story, with well-developed characters and a complete arc for Billy and Captain Marvel, in only 22 minutes. Batman may be getting the regular team-ups over on "Batman: The Brave and the Bold" but Superman ends up with the best animated team up of the year here. "Superman/Shazam! 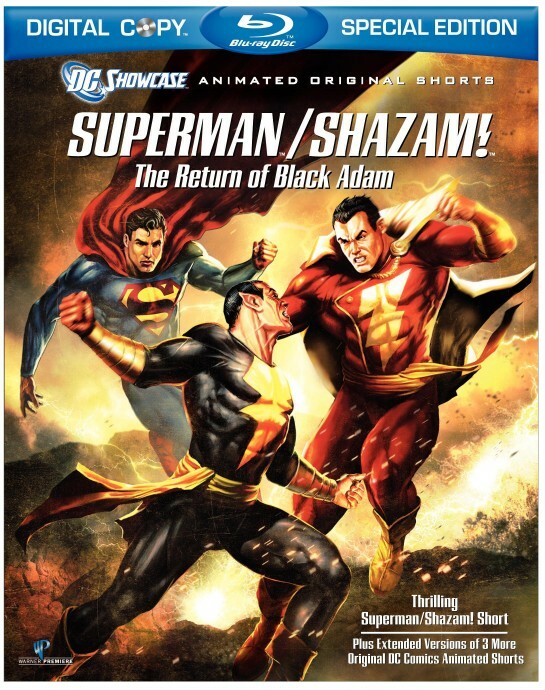 : The Return of Black Adam" is available now on DVD and Blu-Ray. 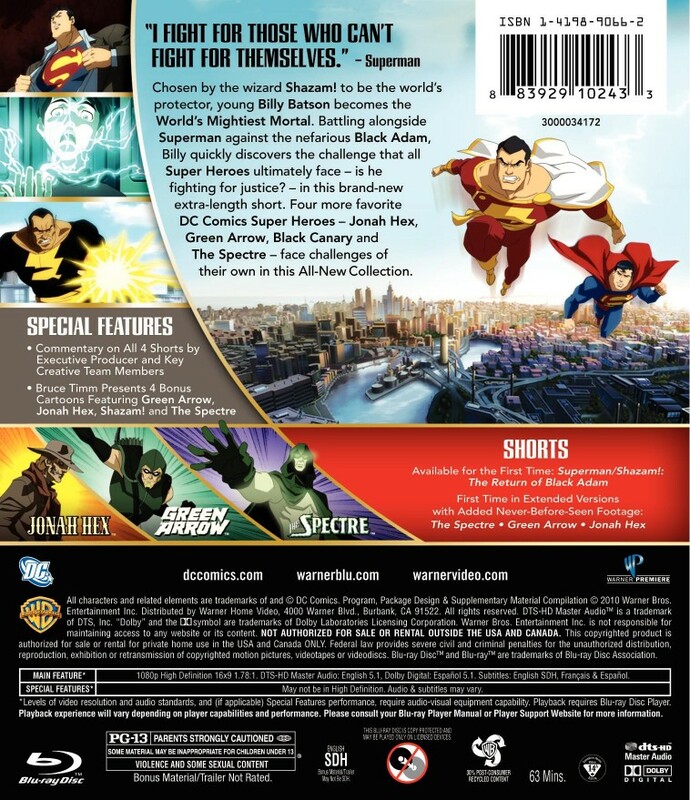 The 22-minute short is accompanied by previously released shorts featuring The Spectre, Green Arrow, and Jonah Hex; plus four episodes of "JLU" featuring these characters.